The time is finally here to announce the release of The L.A. Journal #2 coming out on February 28th. Yet again, we were able to work with amazing bands, labels and people behind the scene, and we couldn’t be more happy with the result. To top things up, we are celebrating this moment with a small party called L.A. Fest. We’ll be joined by our good friends in Gone to Waste, Client., World Weary, Teethgrinder, ANGST and LOTUS in a venue called ACU in Utrecht, the Netherlands where we’ll also be exhibiting art by the extremely talented Florian Schömmer (the man behind the artwork of Client.’s new album Joy Is The Only Treat) and work by Anne Carolien Köhler and Max Horn. So come out on this Saturday afternoon to hang out, have drinks, eat good food, enjoy great bands and grab the second copy of The L.A. Journal. DIY or die. We’d like to know if you can make it, so please RSVP here. 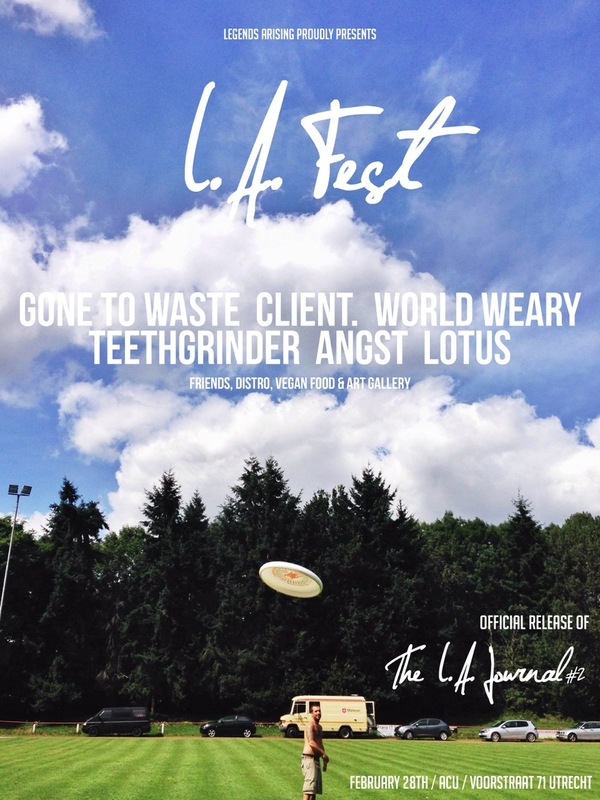 Tags: ACU, Angst, Client, Gone To Waste, L.A. Fest, LOTUS, Teethgrinder, The L.A. Journal, Utrecht, World Weary. Bookmark the permalink.